A stretch for the front and back of the neck. This exercise seems to cause the most problems during ki testing usually because of tilting the head past the center plane of the body. It is done by rotating the head, by tilting the chin up, not by rotating the base of the neck. 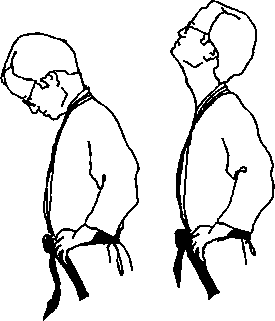 With hands are on hips, drop chin to chest. Rath» than pushing the chin into the chest (compression), think of stretching the back of the neck. To check yourself say "ahhhh" throughout. 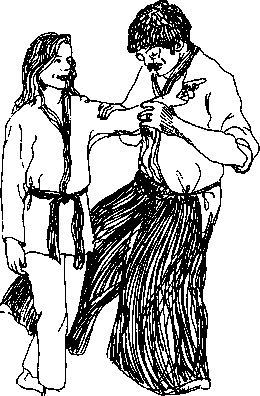 Choking or strangling noises are a sure sign of compression.